This month I was in Salt Lake City, Utah attending The RV Experience (RVX) for Go RVing’s Kickoff to Camping Season. There I encountered surprisingly pleasant March weather and a firsthand look at the hottest, most innovative adventure RVs for camping season. It was the first event of its kind, and if you were following my Instagram stories during the event, you may have scored a peek at the exciting reveal of RV winners across 9 categories. It was pretty epic… there were massive curtain drops and everything! One quick glance at my travel photos and you can tell I adore outdoor travel. Which is weird since I’m a city girl, born and raised. But my love for deserts and mountains, stunning landscapes, and personal wellness makes me want to see every peak and park, and be able to grab any gear along the ride… all without sacrificing comfort. The best adventure RV for outdoor adventures this camping season, is none other than the SylvanSport VAST — which is perfect for all of the above! I had no idea off-road trailers like this would even be classified as an RV, but it can manage rugged adventures and is completely self-contained, so no more cramped road tripping. I spent four years chasing wanderlust around the world with Alex, with part of each year exploring the United States for months at a time… always in search of a new experience. Van campers are a special type of RV: one that is easy to drive as a cargo van (thank goodness!) and intelligently maximizes space for your daily work and play needs. You’ll find lots of digital nomads and remote workers obsess over #VanLife. And with good reason. The best camper van RV is ModVans CV1 Camper Van. A modular vehicle that is both affordable, easy to maintain, and even has a pop-up camper top! Winnebago’s Revel and Travato Pure 3, Leisure Vans 2019 Wonder Rear Twin Bed, and Coachmen Galleria 24 A. As mentioned, I've been a city dweller for the majority of my life. You know... circling the block for 2 hours looking for a parking space. Driving down two-way roads the width of a one-way alley. And knowing how to live comfortably in a tiny apartment. There’s a special type of minimalist, small RV for city escapes. It must be easy to maneuver, comfortable to relax in, yet not sacrifice residential style. The nimblest RV for a city escape is winner, Leisure Travel 2020 Unity Rear Lounge. The Sprinter coach offers a “Smart RV” system and can easily fit a city lifestyle. RVX was at the Salt Lake City convention center, Salt Palace. There were plenty of hotels around the venue and it was an easy walk across the street to get there. I registered beforehand, and received my badge upon arrival. The event included exhibit floors and breakout rooms for sessions, with a few yummy food stands too — but time flew by as I enthusiastically triggered my outdoor wanderlust, browsing RV after RV. Here are photos of some of my favorite RVs seen around the exhibit floor. I felt like a kid in a candy shop! Which one would you take on a camping adventure? SylvanSport - I had no idea this was an RV! The tent-like structure called my name from a distance and once we connected, I had a hard time stepping away from this one. Airstream - This classic vehicle is a dream come true. Standing next to one gave me chills… I had only seen it in movies! And now Airstream has smart technology to keep it ahead of the game (they won the innovation category). Gulf Stream Vintage - How adorable is this turquoise inspired RV? I felt like I stepped into a diner! ModVans - A winner of the #VanLife category, the pop-up rooftop is an instant game-changer. TAXA Mantis & Cricket - Not only did TAXA have one of the most enticing booths (camp season, for real) I loved both of their exhibited trailers. Whether I am living in Philly or New York City, I need a vehicle that can maneuver through tight spaces (or at least look cool enough that people are understanding as I try to get by!) But as a lover of our parks, I am also often concerned about the footprint us adventurers and explorers leave behind. I want there to still be parks around for the generations after us. At the RVX event I learned that destination and luxe RV camping are just a couple types of RV styles; that I don’t have to marry that RV category with my outdoor experiences if it doesn't fit my lifestyle. There is so much more to choose from! In fact, I was shocked to see how many RVs would perfectly fit a city, off-road, and minimalist lifestyle. Smooth enough for navigating a city and making stops to experience local culture, yet comfortable and rugged enough to escape the concrete jungle altogether and venture beyond your comfort zone. 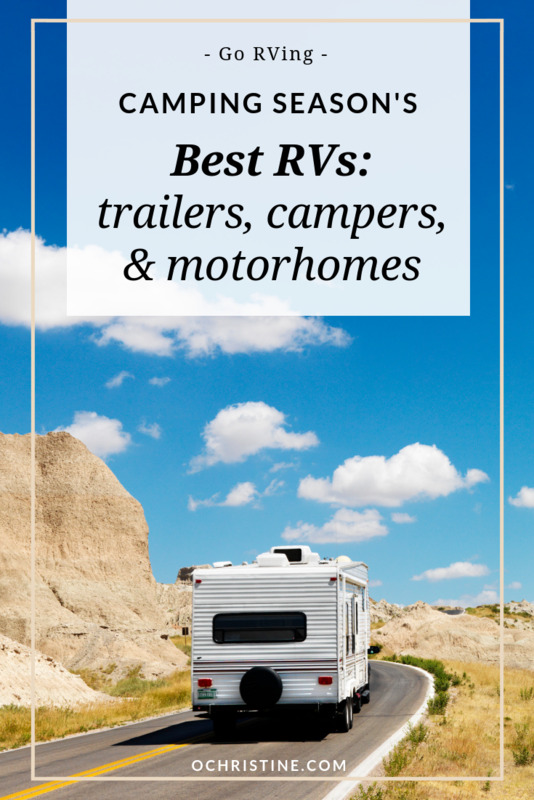 Recreation Vehicles are not just Fifth Wheel travel trailers or Type A Motorhomes (though those are great for families, pets, and residential RVs). They aren’t just an episode of luxurious MTV Cribs either — though, sheesh those look awesome! There are different sized trailers, campers, and motorhomes and these RVs can fit different lifestyles, adventures, and yes — even budgets. With customizable options and varying styles, there is a perfect RV out there for everyone. Where will you adventure with an RV? Are there particular features you just must have? Be sure to check out Go RVing’s Kickoff to Camping Season to find RV dealers and campgrounds near you.